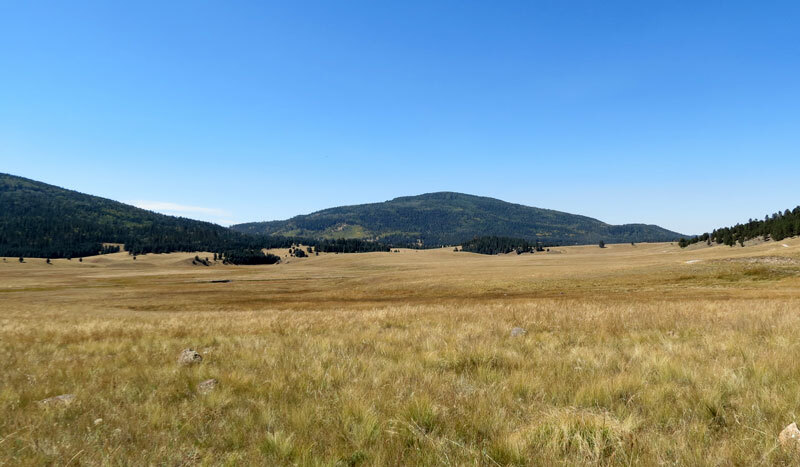 I realized that we were very close to the northern border of the 13-mile diameter crater that forms Valles Caldera, one of the sites in Birding Hot Spots of Santa Fe, Taos and Northern New Mexico. Barbara Hussey and I had registered for one of the 24 daily back-country permits issued by the National Park Service that allowed us to drive our private vehicle on the only road that takes visitors into the interior of the preserve. 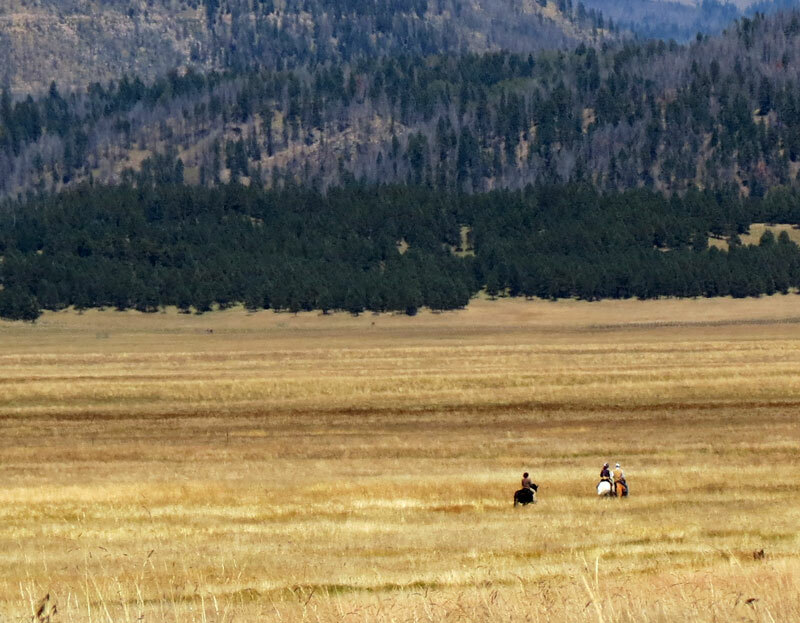 With the transition from the privately managed Valles Caldera Trust to the National Park Service, we wanted to explore areas that had not been open to the public. After September 30, no back-country permits will be issued until May 15. I had birded along the road into and around the Visitor Center (previously called Staging Area) in late June and again in late July. Even though many of the birds would have migrated, we were anxious to explore the more remote areas of the caldera. 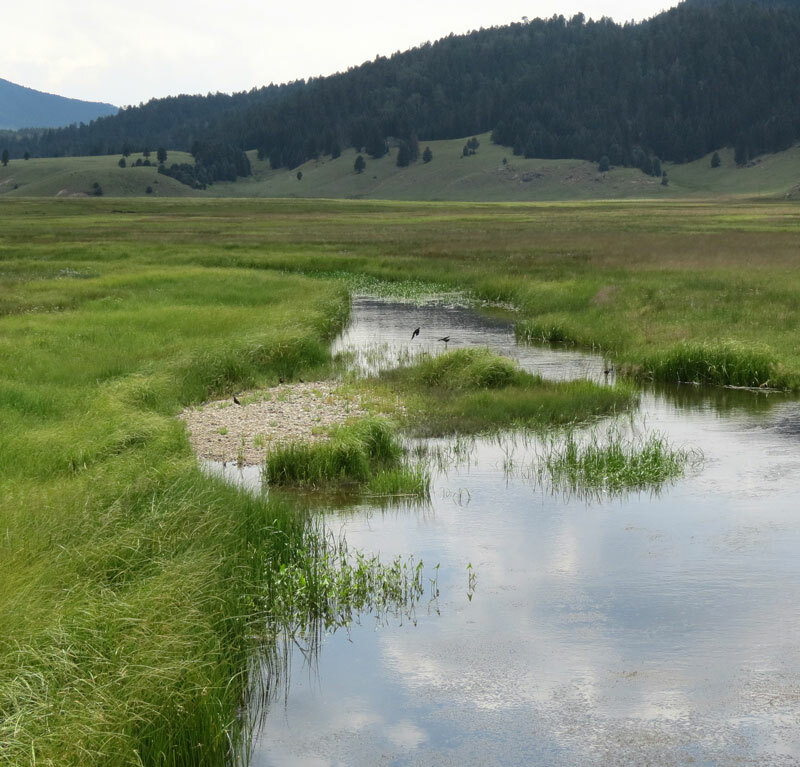 as well as Red-winged and Brewer’s Blackbirds along the East Fork of the Jemez River. In prior years, I have seen and/or heard both Western and Eastern Meadowlarks. I drove with my windows down and pulled over where it was wide enough for another car to pass and watched for hidden sparrows to pop up and start singing. 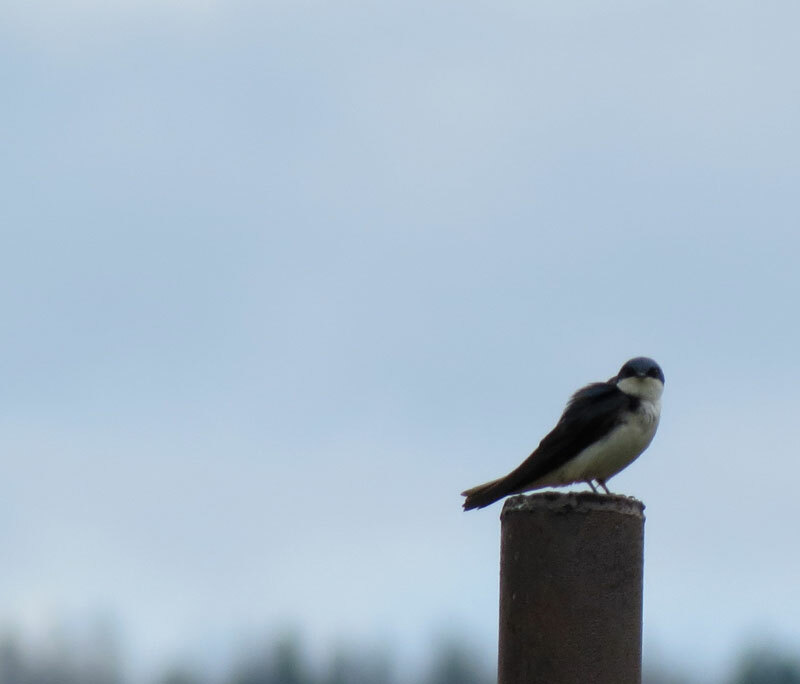 as well as a single Tree Swallow. 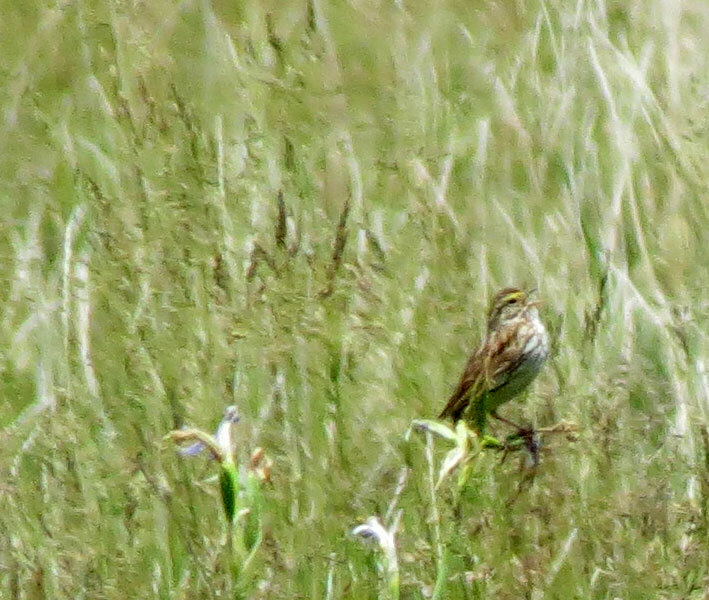 In the nearby grassland were more sparrows. 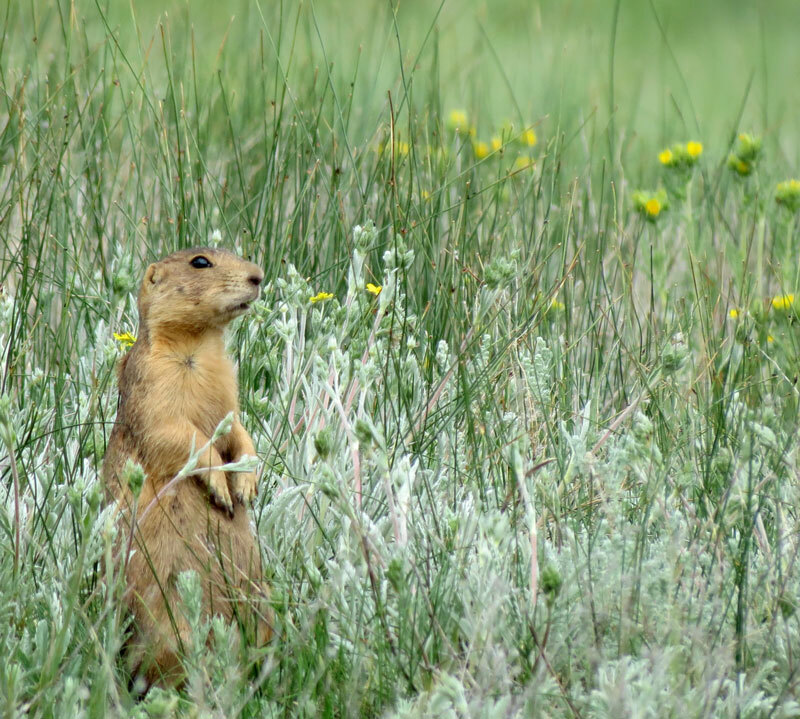 Rotating ‘sentinels’ in the prairie dog colony issued alarm calls from time to time. 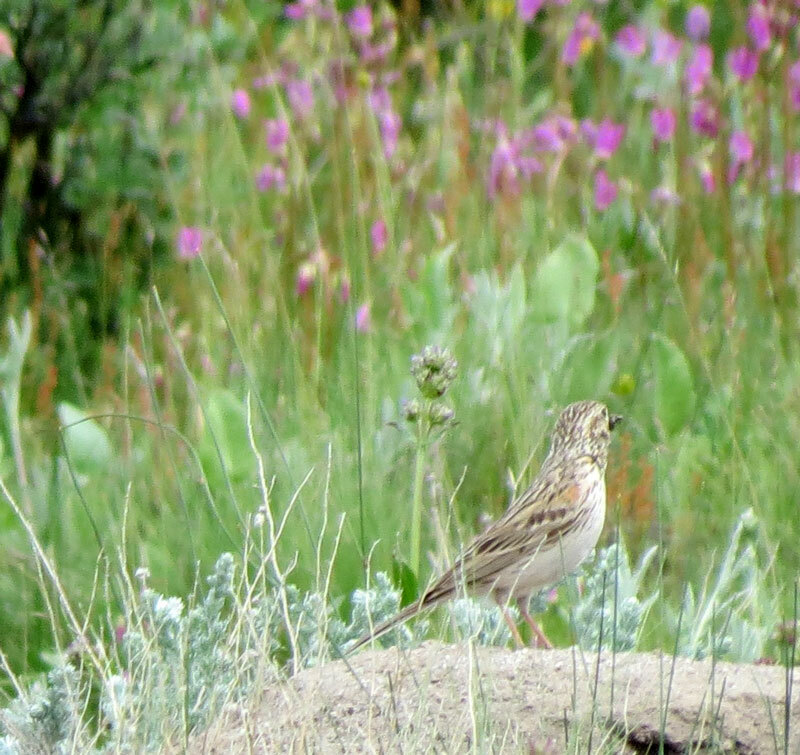 By late July the grassland was quieter and sparrows flew in and out along the road, rather than staying deep in the ground cover. 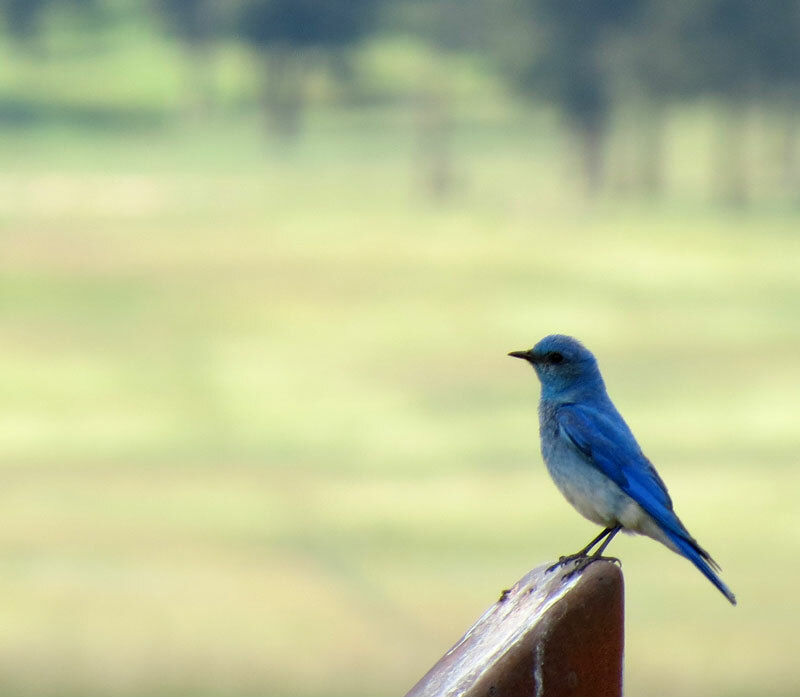 Mountain Bluebirds had moved from the edges of the ponderosa pine habitat into the grassland and their numbers had greatly increased. We counted at least 25. 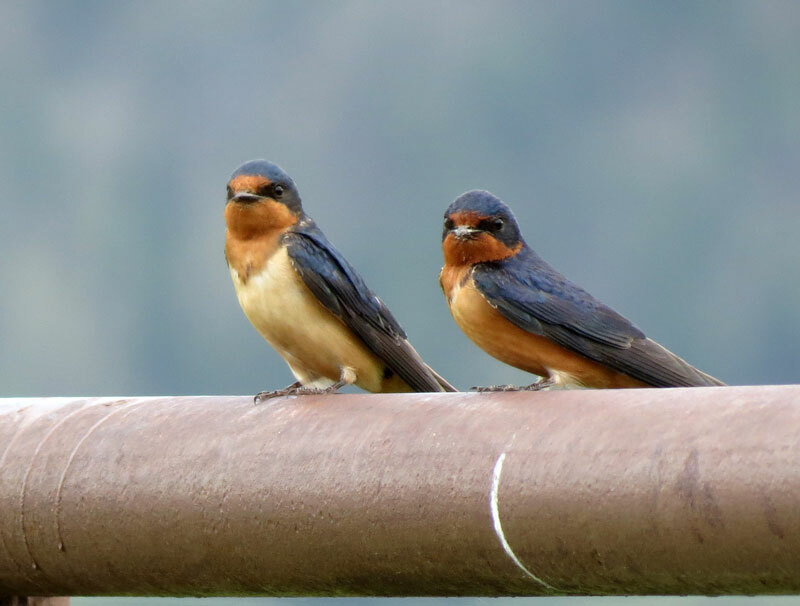 Many of the three species of sparrow species were juveniles and the Barn Swallows were incubating their second broods under the eaves of the Visitor Center. 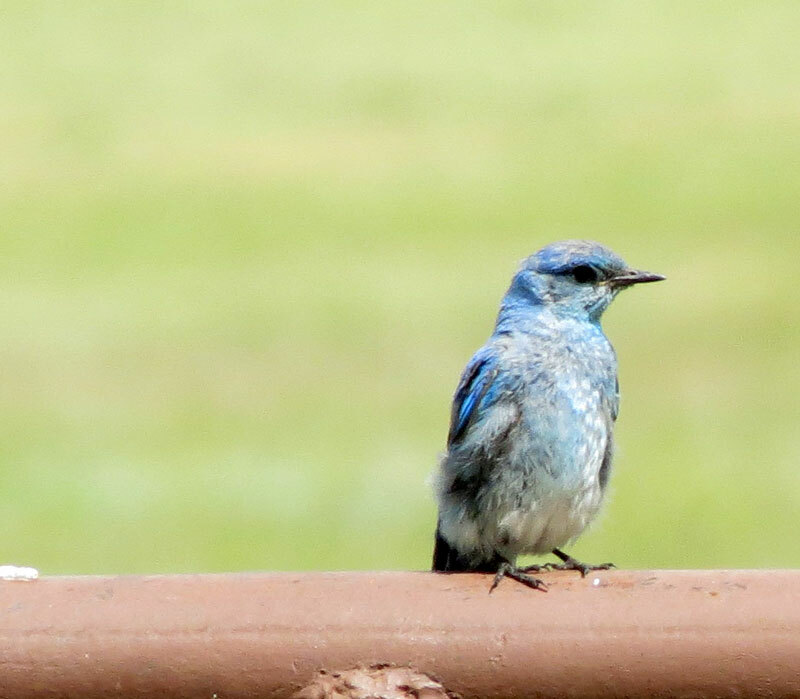 On September 19 as Barbara and I drove towards the Visitor Center, there was a Mountain Bluebird on almost every sign post, but the now-brown grassland was otherwise quiet. As we started into the back-country on the graded dirt road, we encountered a large flock of Brewer’s Blackbirds, many molting into their alternative plumage, and many more Mountain Bluebirds. Groups of horseback riders headed off across the countryside to explore. As we entered ponderosa pine habitat near the headquarters area, a Golden Eagle soared over the nearby cliffs and Northern Flickers flew from tree to tree. Back-country rules, reiterated by the ranger, specified that we were to park only in designated areas, so it was difficult to stop and check out smaller birds that busied themselves in the trees. 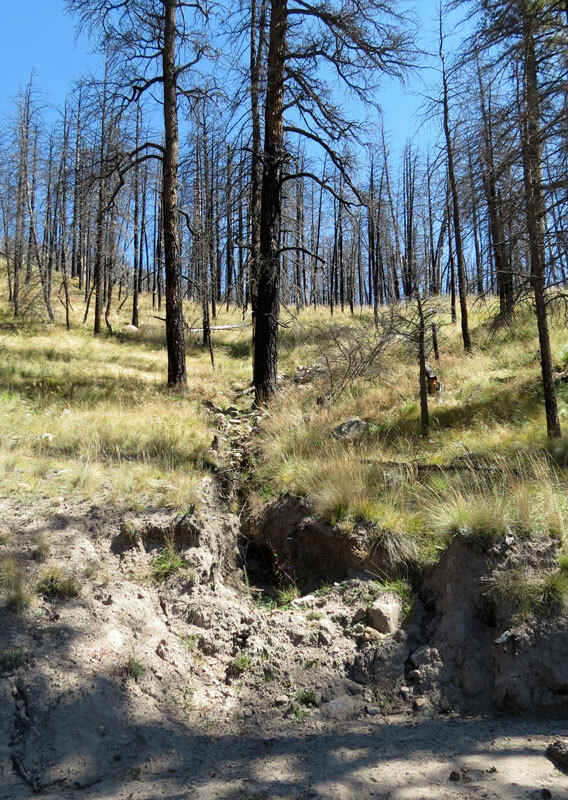 As we drove around the Cerro del Medio, one of the areas closed to the public, we saw evidence of erosion from the fire-damaged hill. The road winds through a series of grassland valleys, dotted with volcanic hills. We wished we had time to park, and then hike on one of the many trails we passed. We will definitely plan to do that next summer. On the return trip, we found a place in the history grove to pull safely over to the side of the road while we ate our lunch. We were entertained by a flock of Pygmy Nuthatches and a pair of Clark’s Nutcrackers. Jorge Silva-Banuelos, the park’s superintendent, stated in a recent press interview that he wants to gradually expand access for the general public, while still protecting the valuable geologic and natural resources. As a start, the fee structure now operates like any other national park, rather than a per-person fee for each activity. I now can use my Senior Access Pass. I was excited to see the new website that came live on October 1 when the National Park Service formally assumed responsibility for the Preserve. Secretary Jewell will be at the Preserve on October 10 to help formally dedicate the area as New Mexico’s newest National Park.